So much of my life is fast-paced that for a while now I've felt out of touch with the (little) things that make me happy. Things like reading on the weekend, writing in my journal or just singing (terribly) in my car while I drive. I want to be so active that I forget to enjoy things. I figured I might create some positive energy with positive words like "love." I noticed I happened to own not only a t-shirt with the word but also a beanie. Perhaps this figurative circle effect of positive affirmation will work! Nancy, you can rock ANY look! It looks fabulous! Yes, it's the little things in life that mean so much. We don't take notice of them very often. We should. 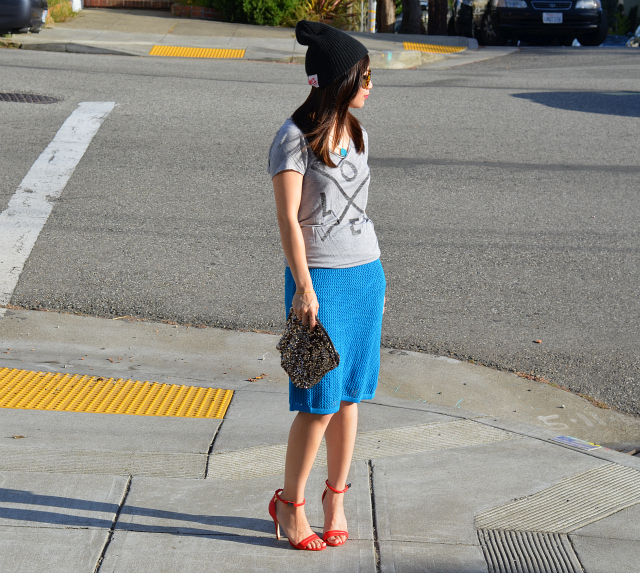 I love the tee with the skirt - the perforated texture is very cool. p.s. I totally know what you mean - my magazines are piling up and the only time I take a moment to get a glimpse at them is when I'm instagramming a photo of them! I love how you mix casual and dressy items together. Love the skirt and heels! it's always worth a shot! i love this tee on you and that skirt is so unique! Your leather jacket rules! I finally got a leather moto jacket last winter and have been wearing it like crazy, even in winter! Love this! Your skirt and shoes are fabulous. 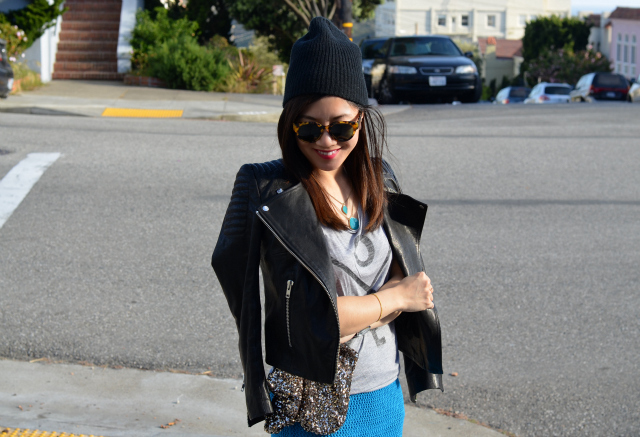 in love w/ all the colors and textures in this outfit! Always - so effortlessly chic Nancy! I was singing in my car the other day (windows closed) and my co-worker pulled up right next to me and caught me. I was so embarrassed! Love the look! it is very edgy ! Please do drop by my blog if you have a chance and follow if you like !